We have all seen a lot of websites which have real-time search filtering. This looks really good and provides a convenient user experience. If you are still wondering what real-time search is, it is a way of displaying the filtered result as the user is typing. This is much better than waiting for the user to finish typing the whole search query and then press a button. 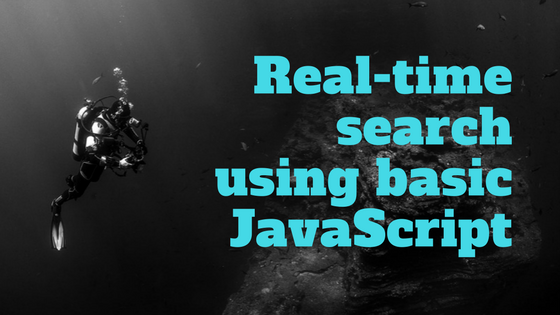 Real-time search saves time because the user need not type the whole query as there is a high chance that he/she will see the intended result before completing the query. So, now we have an array of strings to search from. Now, we need to make a function that can fetch all the relevant strings from the array based on the user’s search query. And this function needs to be called for every letter the user types. Based on the result of this function, we need to change the view and display the result on the screen. That’s it. That is the concept behind real-time search. In this step, let’s create the array we were talking about. In the same directory create a file called “main.js”. In that file copy-paste the below array. Now, it’s time for the most important part of the code. The function to filter the array. Let’s break down the required function into small pieces. Let’s call the function “updateResult”. All functions generally have an input and an output. In this function, the input will be the what the user types in the search box. This will be the only argument the function takes. It won’t have any output but it will have an action i.e changing the view. So, it need not return anything. Now, we need to call this function every time the user types something. The easiest way to do this is the “oninput” attribute of the “input” element. So, put an oninput attribute to our input box and pass its value. Iterate through the array to linearly check each element if the entered words match the array elements. To check if it matches, you can use the Array.indexOf() function. If it returns -1 it doesn’t match. We need to call the indexOf() function f or each of the words the user enters. We can do that by using the split() and map() functions. Don’t forget to use String.toLowerCase() to ignore case sensitivity. 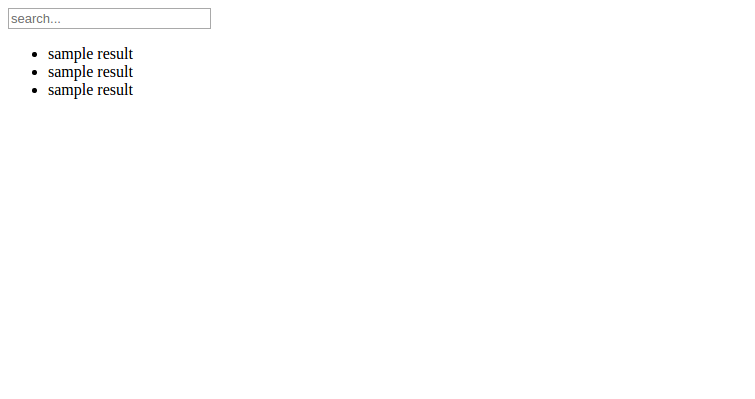 Everytime the ‘if’ condition passes, we need to add the ‘algo’ to the result list in the html page. 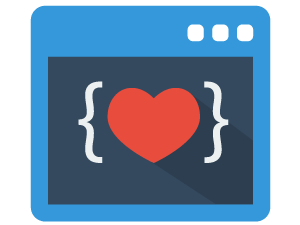 For this, we can create a DOM object of the list and update its ‘innerHTML’. This will keep adding items to the list as the function is called. The items will keep stacking up. To avoid this, we need to truncate the list at beginningning of the function itself. So, finally your code should look like this. Open the index.html file in your browser. It will look something like this. I hope you understood how it works now. In this tutorial, we used simple linear search. This won’t always be feasible. When there are more elements in the array, better search algorithms need to be used. If you know of any good algorithms, please share in the comments below. Also, I will be hosting the code I wrote on GitHub. Feel free to make contributions. Thats a very neat code, but I found this little bug. When u set “con con con con” as the query filter, the item “array-concatenation” is being added like 4 times to the final result. before an item being added we should check whether algo we’re working on is not in the results already to avoid creating redundant result. Nice catch!! This is a simple boilerplate code for the filter just to explain how it works. There could be a lot of bugs. They can be squashed based on the use case. But again, nice catch! A beginner might have trouble spotting this. Yes!! Thanks for pointing it out. I don’t know how I missed it. I’ll change it.